Things are starting to get really interesting in the UAAP Season 81 men’s basketball tournament with six teams vying for those coveted top four spots. Adamson and Ateneo are tied for the No. 1 spot with 7-2 records while Far Eastern University and De La Salle are in stable ground with 5-4 slates to share third place. University of Santo Tomas and University of the Philippines, though, aren’t far behind with their 4-5 cards, making them legitimate threats to enter the upper half of the standings. Oh and a couple of players made statistical history, and a shoutout though to National University’s Ria Nabalan for making history in the women’s division and becoming the first woman to be named Chooks-to-Go/Collegiate Sports Press Corps UAAP Player of the Week. The Lady Bulldog lit up for 40 points while also grabbing six rebounds and dishing out eight assists in her team’s 72nd straight win. Angelo Kouame’s performance for the Blue Eagles in Week 6 was downright scary. The 6-foot-10 center was a man among boys when Ateneo lambasted Far Eastern University, 82-62, putting up 33 points and 27 rebounds en route to sharing the Player of the Week plum with Nabalan. Kouame was Ateneo’s focal point during its lone game this week with stars Thirdy Ravena, Matt Nieto, and Mike Nieto being absent against the Tamaraws. And it was in the absence of those wing stars that Kouame decided to make history by being the first man in 10 years to have a 30-20 stat line since Ateneo’s Rabeh Al-Hussaini had 33 points and 20 rebounds in the Blue Eagles’ 72-66 loss to FEU. Well, talk about a reversal of fates. If Kouame numbers were jumping over fences and breaking through walls, there was one center this past week that was just chilling. The Soaring Falcons’ Papi Sarr was a cool bean in Week 6 becoming one of the league-leaders in their perfect 2-0 run against La Salle and NU. Sarr averaged a quiet double-double average of 14 points and 13 rebounds as Adamson effectively put its two-game skid at the end of the first round to start anew in the second half of the season. The former high school stars from a year ago have been a treat to watch this season in the UAAP especially when they go up directly against each other. 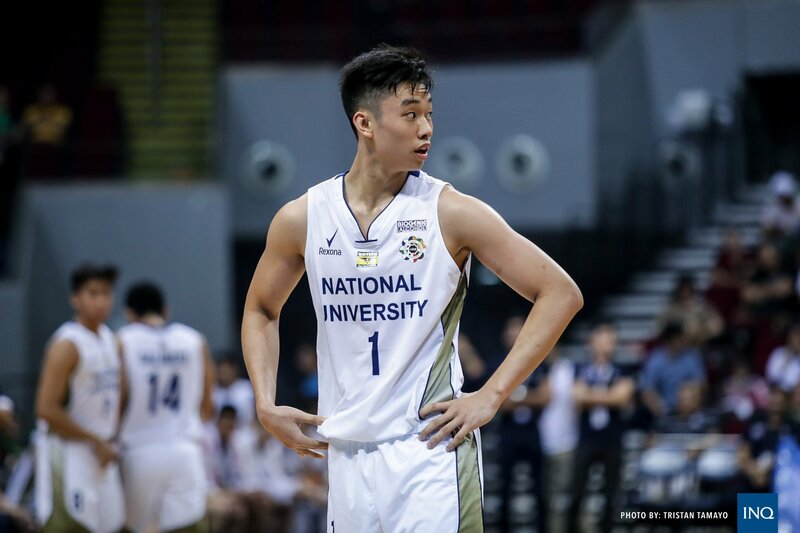 NU split its two games this week, a 69-58 loss to Adamson and a 69-61 win over UST, but there was one constant in those outings and it was youngster Dave Ildefonso. In the Bulldogs’ matchup against the Growling Tigers, the game got turned into a microcosm as Ildefonso and CJ Cansino crossed paths in a showcase of youngsters. Ildefonso, who said that Cansino brings out the best in him, promptly one upped his batch mate to the tune of 16 points, four rebounds, three assists, and a couple of clutch plays. NU’s rookie duped UST’s wunderkind with the same two plays down the stretch and scored five points in the Bulldogs’ game-closing 6-0 run. Ildefonso’s second layup, which was against the defense of Cansino, gave the Bulldogs a 65-68 edge with 2:58 to play. Another thing, Ildefonso is 2-0 against Cansino in their first year in college. If Sarr brought the physicality inside the paint for Adamson, Jerrick Ahanmisi delivered that oh so sweet shooting from rainbow country. Ahanmisi averaged three 3-pointers this week for the Soaring Falcons while putting up a 15-point scoring average. The third-year shooting guard was quiet in the Falcons’ 57-50 win over De La Salle scoring just nine points, all of which came from beyond the arc, but turned things up a notch in their 69-58 win over the Bulldogs with 21 points on an 8-of-13 overall shooting. University of the Philippines desperately needed a win to keep itself up in the race for a Final Four spot and sophomore Juan Gomez De Liaño delivered the good for the Fighting Maroons. Gomez De Liaño registered the league’s first triple-double in 12 years when he had 15 points, 12 rebounds, and 12 assists to help UP get a share of the fifth spot with UST at 4-5. UP’s Marvin Cruz was the last one to notch a triple-double with 22 points, 11 rebounds, and 10 assists in the Fighting Maroons’ 98-88 loss to the Blue Eagles on Aug. 20, 2006. It’s always fun when a player has a narrative with a certain team and in Sean Manganti’s case it was with De La Salle. Manganti was once a hopeful high school kid who tried his luck with one of the junior teams La Salle has in its educational system, but it never happened for him and instead he became a Soaring Falcon. Seven years after the bitter rejection, Manganti finally got one against the Green Archers when he led the Soaring Falcons in their 57-50 win. Manganti put up 19 points and grabbed 12 rebounds against the school that once rejected him in a performance that ultimately erased the bitter heartbreak he once got. Oh and he had a solid game of 11 points while playing the supporting role in Adamson’s 69-58 win over NU. Bright Akhuetie is usually featured as one of the frontcourt players in this list but he had to take a backseat for this edition since UP played just one game this week and frankly it was against the undersized bigs of University of the East. There was no possible defender against Akhuetie, who had 28 points, 12 rebounds, and two blocks as he bullied his way to the basket for a 12-of-14 shooting clip.